David Lloyd George by Sir William Goscombe John, a bronze full-length statue on a granite base with inscriptions to the front and back and two bronze reliefs at the sides, on a stepped plinth. 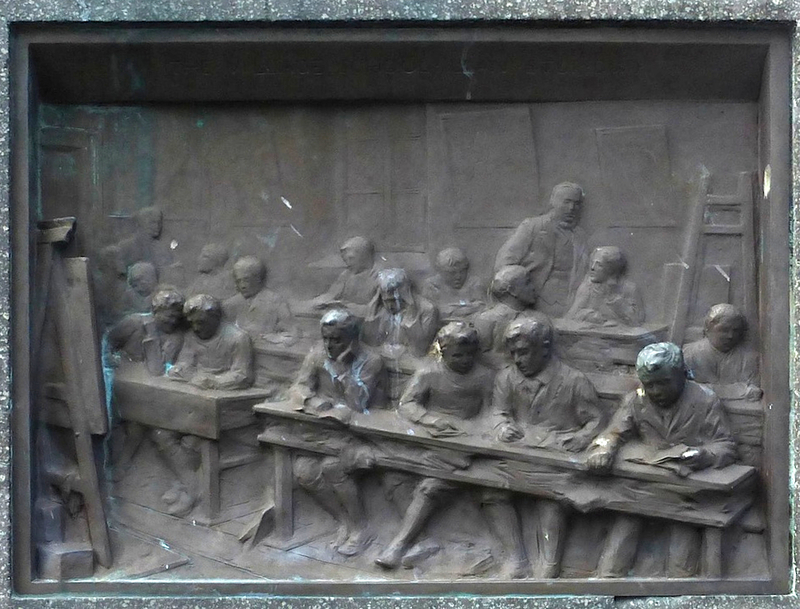 The base was designed locally, by J. Fletcher Ltd, but the bronze was cast by the foundry of A. B. Burton in Thames Ditton, Surrey (see listing text). Grade II listed, the statue was erected in 1921 while Lloyd George (1863-1945) was still Prime Minister. 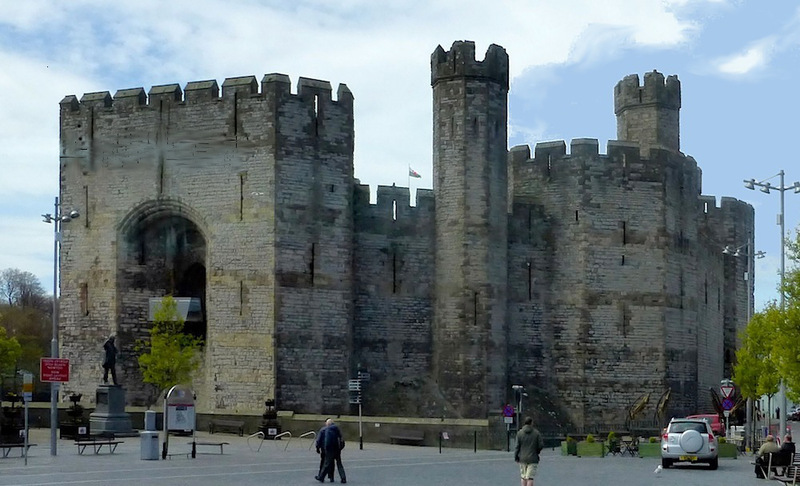 It stands on the terrace beside Caernarfon Castle, in Castle Square. Lloyd George was born in Manchester but grew up in Caernarfonshire. He was elected MP for the constituency in 1890, rising to become Chancellor of the Exchequer (1908-15) and then Prime Minister (1916-22). He was enormously important: as Chancellor he laid the foundation of the welfare state, and as Prime Minister he played major roles in the Versailles post-war peace negotiations, and in the Irish partition. 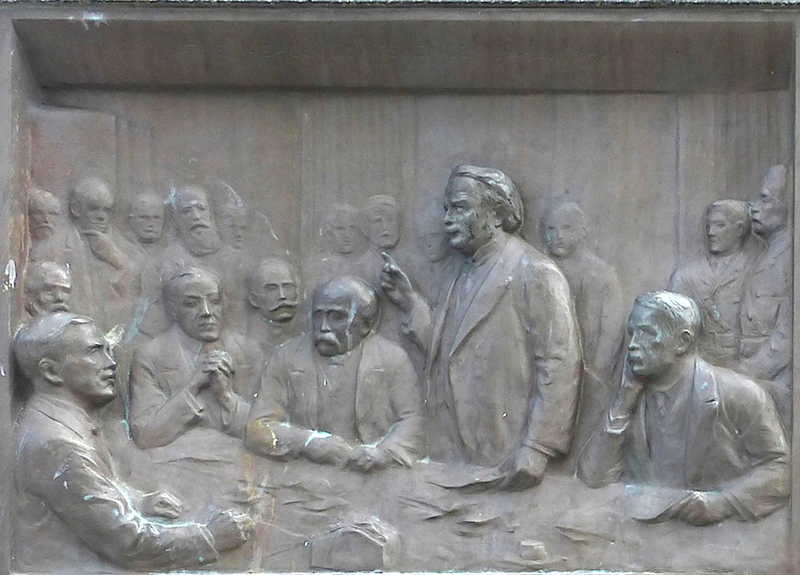 The relief panels above show (left) the village school at Llanystumdwy, which Lloyd George attended until he was fifteen, and (right) the Paris Peace Conference of 1919, where he played the leading role. 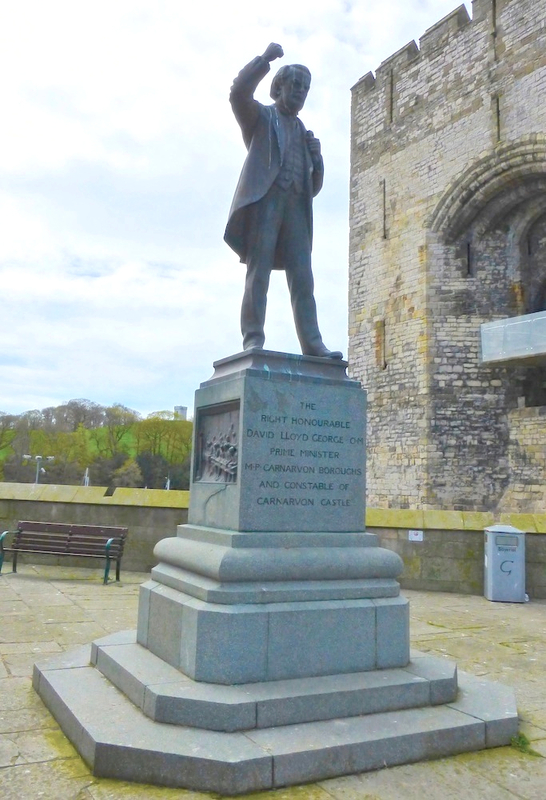 The listing text says that the memorial is not only important for its subject and sculptor, but for its contribution to "the historic character of Castle Square and the setting of Caernarfon Castle." The statue can be seen in situ in the photograph above, just to the left of the great castle archway (click to enlarge the picture). Morgan, Kenneth O. "George, David Lloyd, first Earl Lloyd-George of Dwyfor (1863–1945)." Oxford Dictionary of National Biography. Online ed. Web. 18 February 2017. 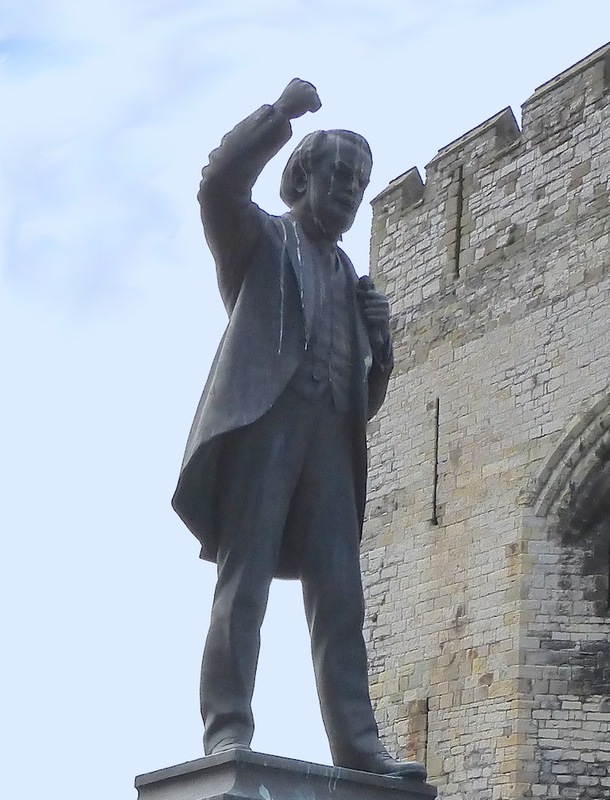 "Statue of David Lloyd George, Caernarfon." British Listed Buildings. Web. 18 February 2017.